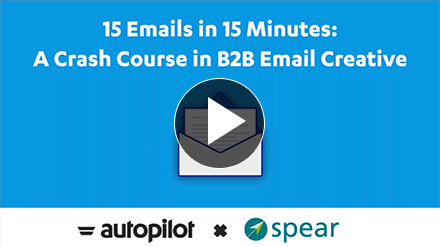 In a recorded Webinar, hear experts from Spear and Autopilot share practical tips and proven strategies for email marketing success. Listen in as Spear President Howard Sewell and Autopilot's Josh Fechter dissect 15 real-life email campaigns: the good, the bad, and the truly awful. I enjoyed your webinar and learned a lot. I sent 12,000 emails over 18 months and not one of those emails led to a conversation, let alone a sale. With what I learned from you today, I think I could now do a much better job. Thanks for sharing – can't wait to try out your ideas!